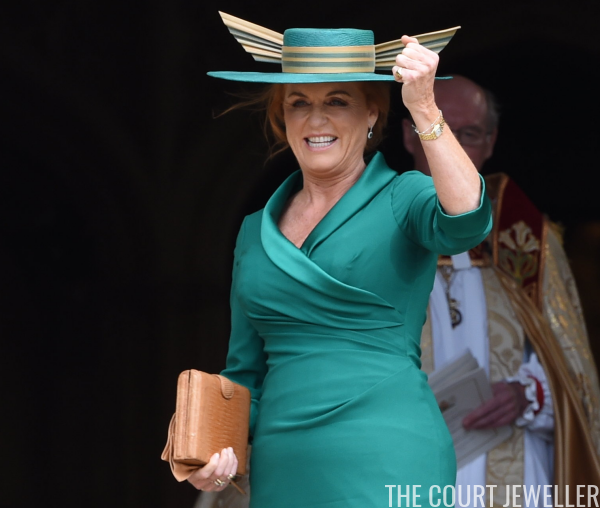 There were royals galore present at St. George's Chapel this morning for the wedding of Princess Eugenie and Jack Brooksbank -- and lots of royal jewelry, too! 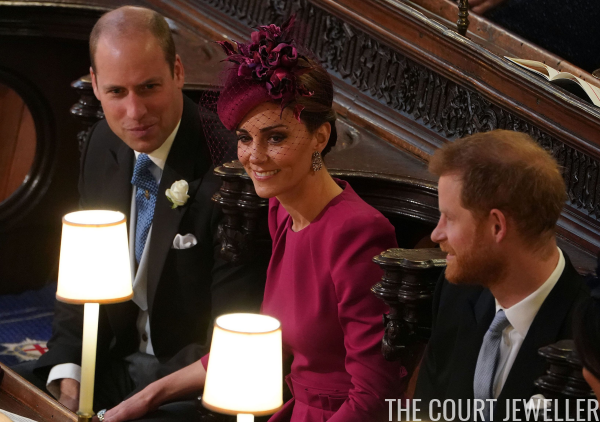 Here's an overview of the British royal jewels worn for the occasion. 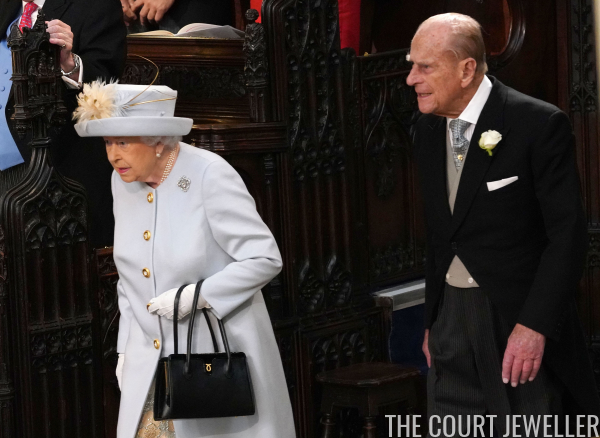 The Queen attended the wedding of her sixth grandchild alongside the Duke of Edinburgh, who was a last-minute addition to the guest list. 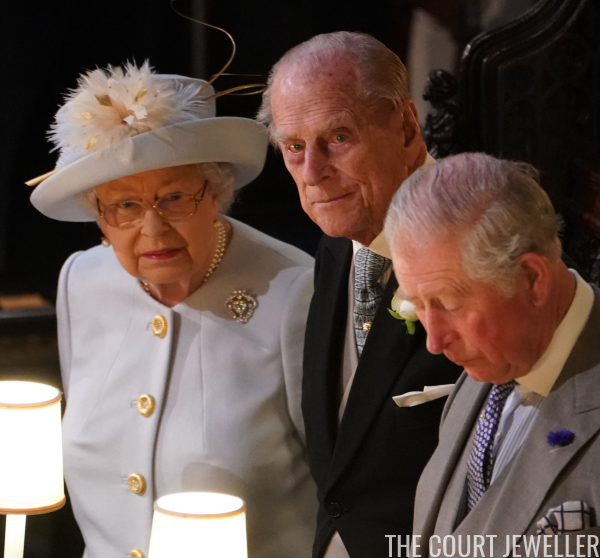 She chose one of her grandest brooches, the Cullinan V, for the occasion. 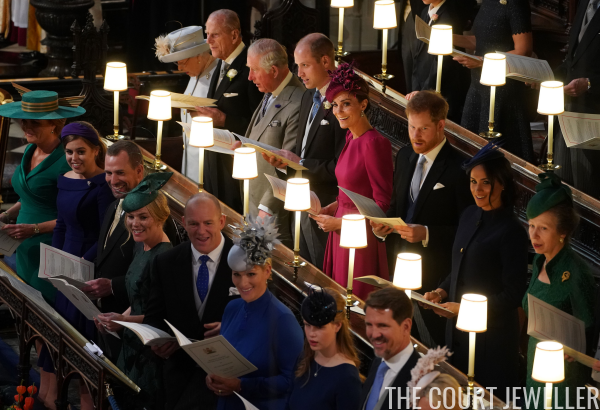 The Prince of Wales sat beside his parents for the ceremony; his wife, the Duchess of Cornwall, did not attend because of a conflict with a previously-scheduled engagement. But no matter -- Fergie was on the scene! 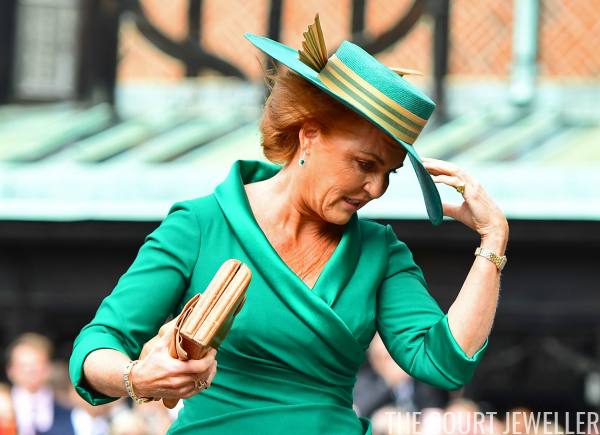 Sarah, Duchess of York wore emerald green, coordinating with her daughter's tiara. 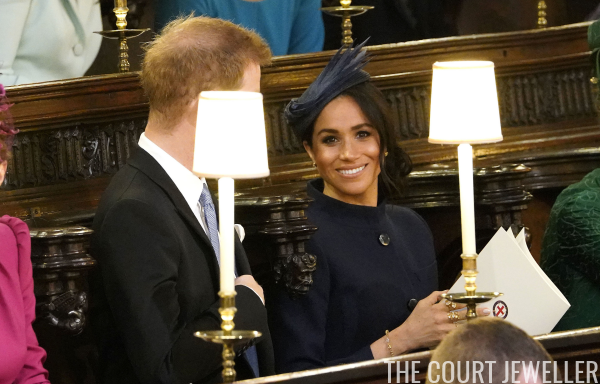 She also carried a meaningful accessory: the same clutch bag carried by her mother, the late Susan Barrantes, for Andrew and Sarah's 1986 nuptials. Fergie wore a mix of coordinating gems and sentimental jewels for her daughter's wedding. 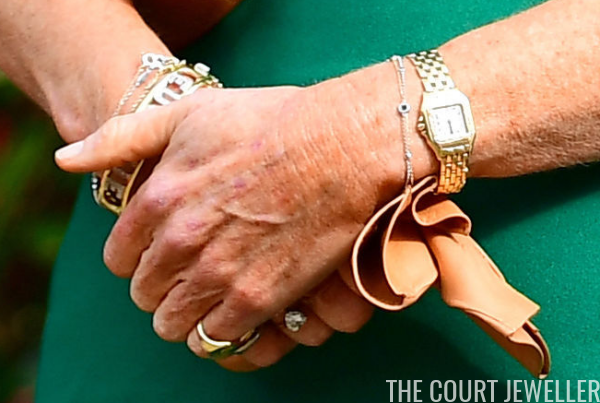 ...while stacks of bracelets, including one emblazoned with her daughters' names, adorned her wrists. 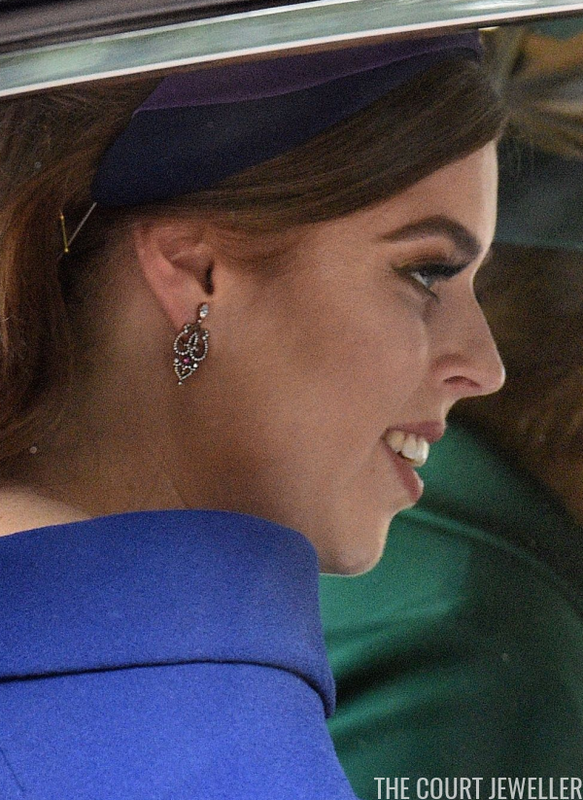 Princess Beatrice, serving as her sister's maid of honor, wore electric blue for the occasion -- and much more jewelry than we're used to seeing on her! Beatrice even wore a pair of earrings. These look to be clip-ons, which makes sense, as I don't believe Beatrice's ears are pierced. 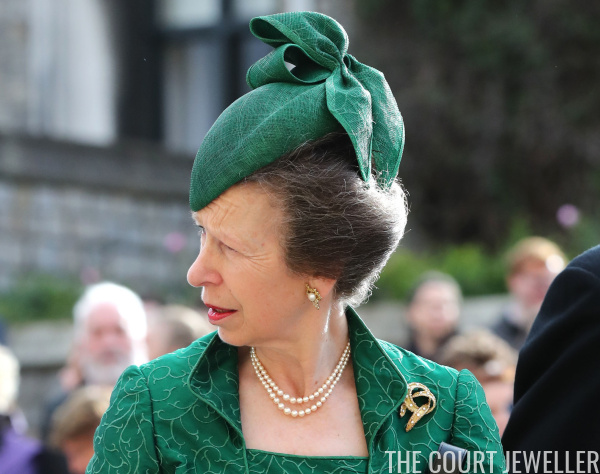 A lovely little diamond bee brooch was also pinned to the neckline of Princess Bea's dress. 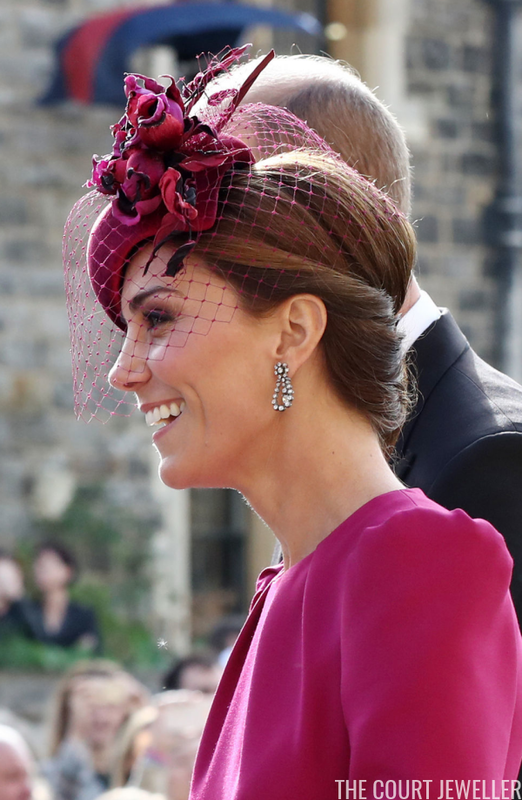 The Duchess of Cambridge was pretty in deep pink for the ceremony. 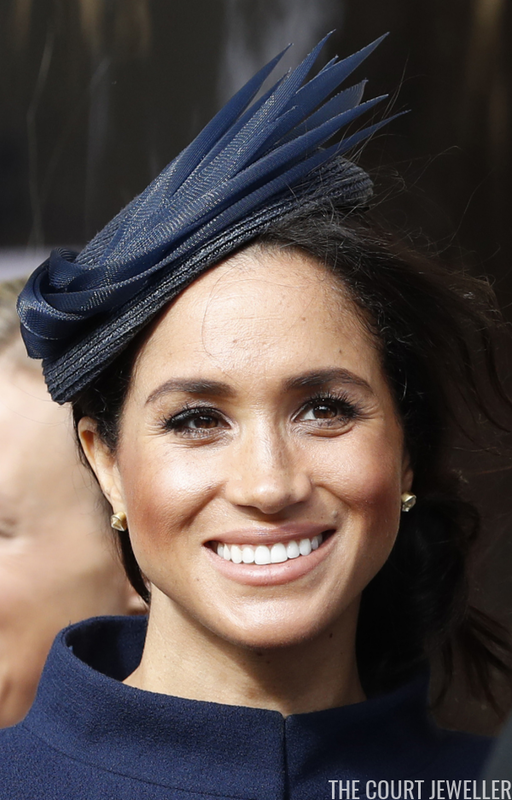 She accessorized with the pair of diamond frame earrings loaned to her by the Queen. 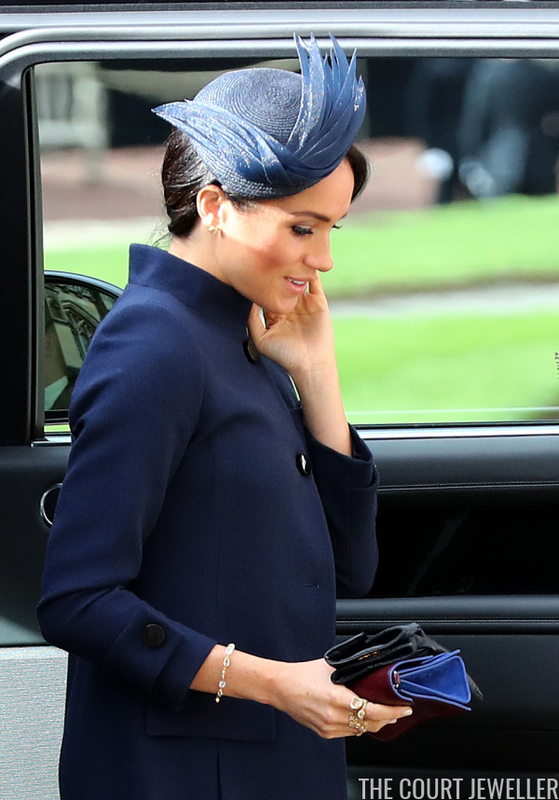 The family's most recent royal bride, the Duchess of Sussex, wore navy for her return to St. George's Chapel. Her earrings featured pale gemstones in bezel-set gold fittings. 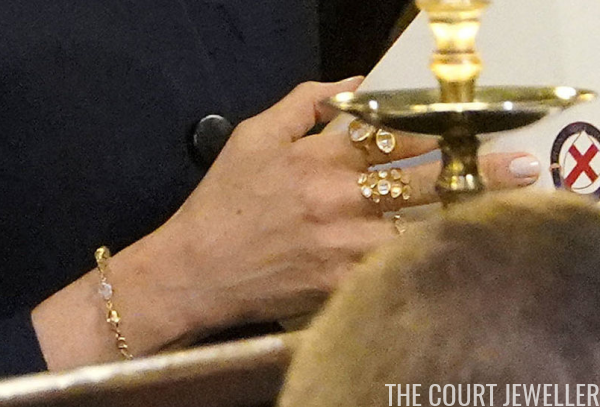 She also wore a bracelet and stacks of rings on her right hand. This close-up makes me think that the earrings and rings (and perhaps bracelet) may all be coordinating pieces from the same designer. 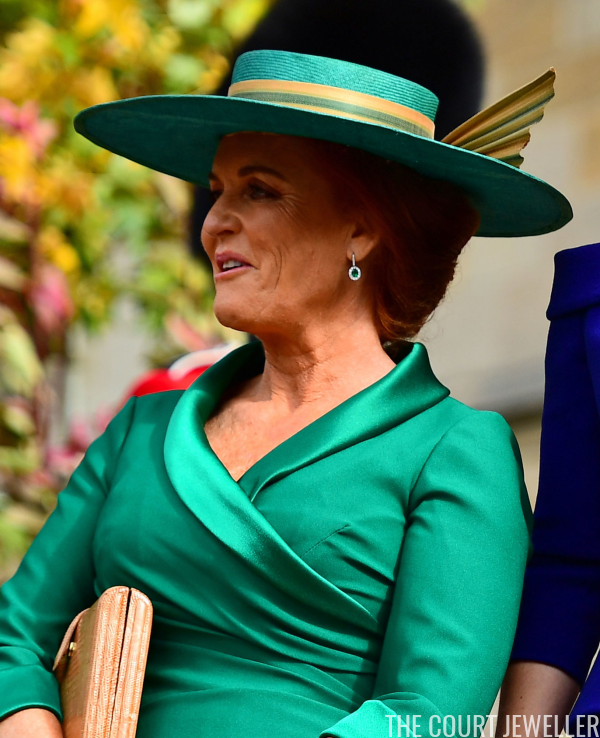 The Princess Royal reached into her jewelry box for some familiar pieces: a double-stranded pearl necklace, her gold and pearl earrings from Andrew Grima, and her gold and diamond ribbon brooch. Autumn Phillips strayed from her usual pearl stud earrings, choosing a pair instead that was a bit more modern in design. Her sister-in-law, Zara Phillips Tindall, opted for a much more classic earring in a drop style. 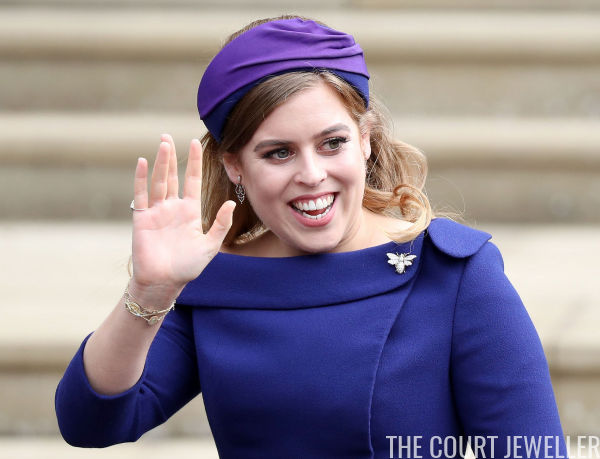 The Countess of Wessex chose a favorite piece, her crystal and resin Dior brooch, for her niece's wedding. She opted not to wear the earrings that coordinate with the brooch, choosing instead to wear pearl drop earrings. 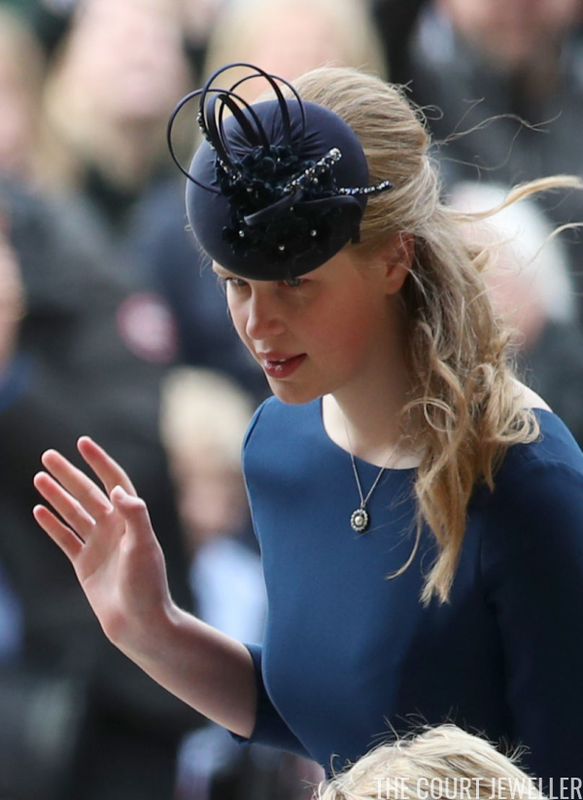 Lady Louise Windsor, who was tasked with wrangling the children in the wedding party, wore the lovely diamond and pearl pendant necklace that also wore this summer at Trooping the Colour. 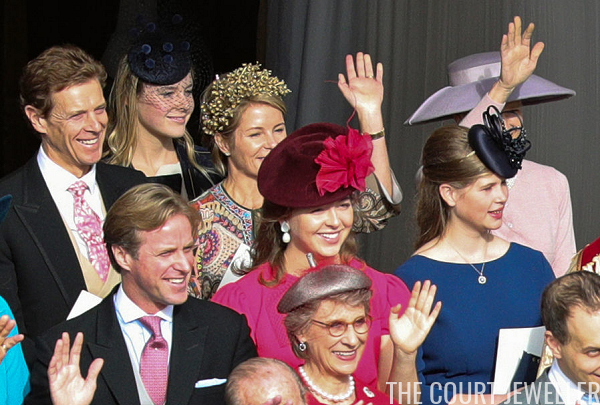 Princess Margaret's children and their spouses were also in attendance, but they managed to hide a bit from the photographers behind Princess Anne's children. 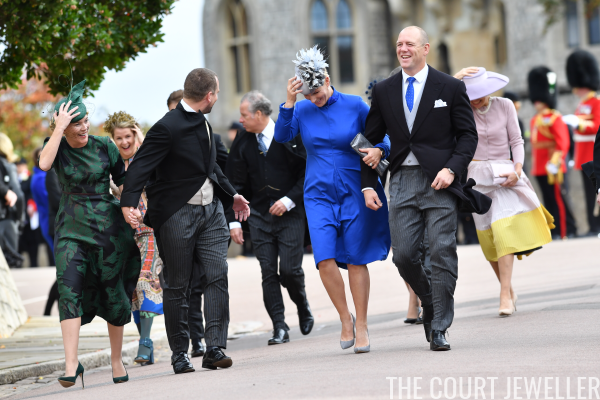 You'll spot the Countess of Snowdon behind Autumn Phillips, and, behind Mike Tindall, you'll note Lady Sarah Chatto, who wore pearls. 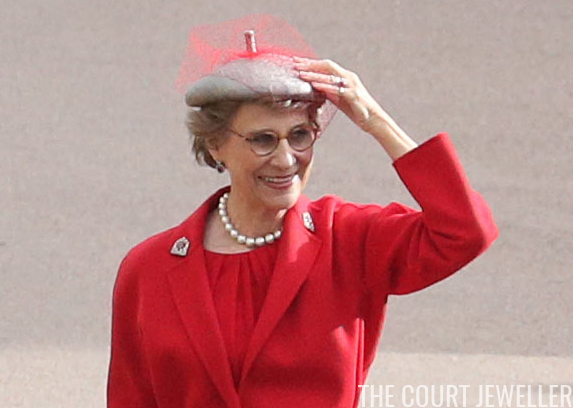 The Duchess of Gloucester also wore pearls, pairing them with pieces from her collection of vintage gem-set clips. 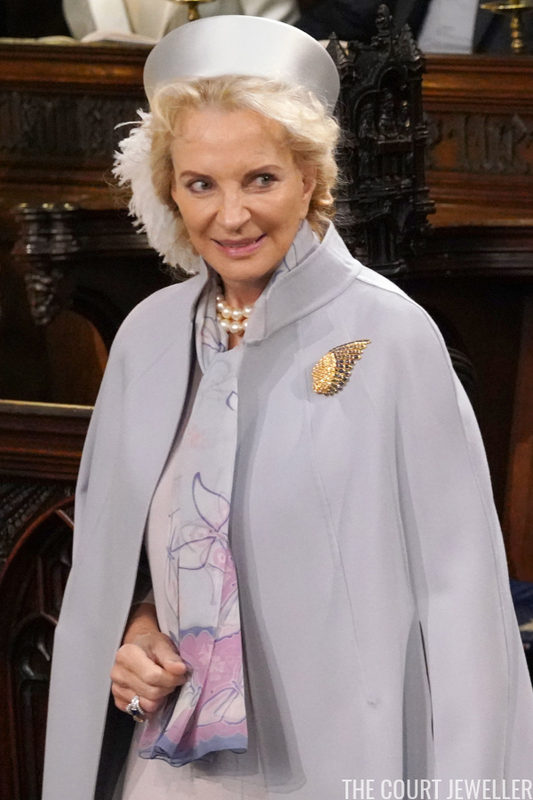 As neither the Duchess of Kent nor Princess Alexandra (who is recovering from a broken arm) were in attendance, Princess Michael was the senior Kent lady at the wedding. She wore pearls with a large wing brooch and a cocktail ring. P.S. : Doesn't Lady Gabriella's fiance (standing beside the Duchess of Gloucester) look like James Ogilvy (Princess Alexandra's son, standing beside Lady Snowdon)? 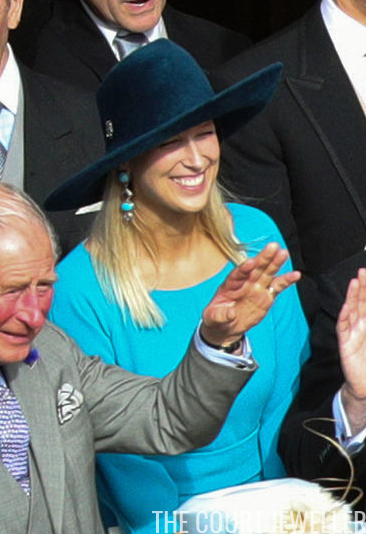 Lady Gabriella Windsor, who recently announced her engagement to Tom Kingston, wore a pair of eye-catching blue earrings. A few more Kent ladies were there, including Lady Helen Taylor, but the cameras didn't catch a good look. But they did capture Lady Frederick! 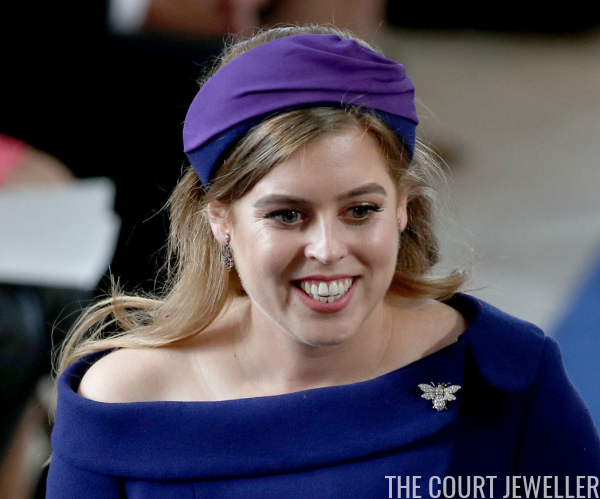 Sophie wore an elegant pair of gem-set drop earrings to watch her daughter, Maud, process down the aisle with the rest of the bridesmaids. 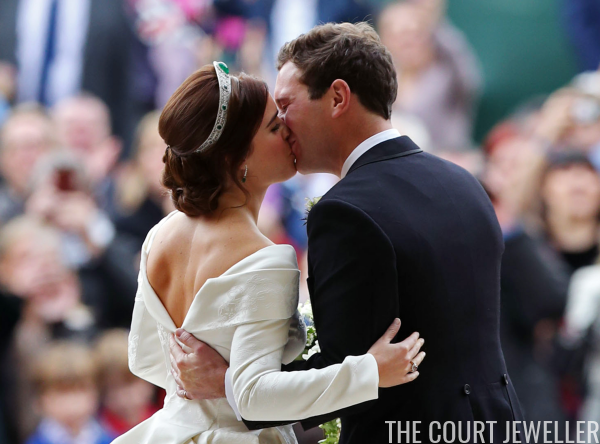 For more on the jewels worn by Princess Eugenie on her wedding day, head over here!